You may be leery about investing on a cryptocurrency trading platform that only came on the scene once bitcoin and many altcoins are on the map. BigONE is one of those exchange startups, but it bills itself as the “most secure and convenient cryptocurrency exchange in the world.” That remains to be seen, however, as it’s still early days, considering the trading platform only launched in November 2017. The CEO is Eric Meltzer. But global exchange BigONE is off to a good start and became a trader favorite with its wide access to coins, including newly issued tokens, and trading pairs not to mention sophisticated trading tools including interactive charting. As long as users have gone through the highest level of two-factor authentication, they shouldn’t have any trouble making withdrawals from the exchange. Otherwise there could be delays. They also did a zero-fee promotion that ran until year-end 2017 to attract new users, which helps it to compete with the likes of Robinhood, whose trading platform doesn’t charge exchange fees. While the honeymoon may be over, many investors are hopeful that it’s just the beginning for BigONE and cryptocurrency traders. BigONE is backed by blockchain investment firm INBlockchain, which in addition to BigONE is also an investor in EOS, steemit, Zcash, MobileCoin, EOS, Candy Box, Global Social Chain (GSC), among others. In fact, several INBlockchain’s portfolio companies are also cryptocurrencies that are supported on the BigONE platform, for instance Monaco and EOS, to name a couple. BIgONE’s CEO Meltzer is also an advisor at INBlockchain, as is Xiaolai Li, an entrepreneur who is said to be the “richest bitcoin owner.” This bolsters their security profile, considering the financial stability of the exchange’s backers, despite the fact that BigONE is a startup. Meanwhile, on Github, users say the prior version of BigONE was yunbi.com, which is based in Beijing. BigONE’s domicile isn’t readily apparent, but Github suggests they are British. Most of BigONE’s website visitors, however, are based in China, as per Alexa data. BigONE is a user-friendly and trendy exchange that isn’t afraid to offer some of the newer coins, including bitcoin forked coins across Super Bitcoin, Bitcoin Gold and Bitcoin Diamond. In fact, there’s no shortage of coins on the platform, ranging from top cryptocurrencies such as BTC, ETH and Zcash to ICO coins including EOS (EOS), Monaco (MCO), aelf (ELF) and ChainLink (LINK). Competing exchange Bittrex, meanwhile, is known to remove coins with insufficient liquidity, so it will be interesting to see how the more the merrier approach pans out for BigONE. BigONE is unique for several reasons, not the least of which it has its own cryptocurrency, BigONE, which trades on Coin Market Cap under the symbol BIG. They have allotted a maximum supply of 200 million BIG tokens. The exchange’s high-tech graphics and trading tools including interactive charts are top notch compared to most other bitcoin exchanges. On social media, users tout the exchange as a “nifty” and “reliable” platform. · Thorough security comprised of hot and cold wallets, multiple signatures, two-step verification, real-time monitoring and more. · Supports multiple coins 33 cryptocurrencies, as of launch. · They’re accessible on multiple messaging platforms including Telegram and Bee in addition to social media sites Facebook and Twitter. · Users have described a problematic account verification process that leaves them unable to make withdrawals. Customer service appears to keep users waiting with no response for days. · Users have also complained early on that not all the wallets were working properly to accept deposits, only the main coins. · Only accepts cryptocurrencies and not fiat money for deposits; as a result, can’t do bank or credit card transfers. · Users don’t get the response they would like form support. Often the issues surround a stalled identity verification process that is due to an old photo or something of that nature. BigONE only accepts deposits in cryptocurrencies. As a result, you can’t transfer from a checking account or credit or debit card, which makes it less competitive with an exchange such as Coinbase, for instance, which does allow checking account and debit-card transactions. Updates on the exchange’s fee table can be accessed here. BigONE claims to be the safest cryptocurrency exchange around, though there’s not much historical data to back this claim up yet. But they do explain why security is so important to them as well as some of the steps they take to keep user accounts secure. While the BigONE management team hasn’t taken much of the spotlight, they did explain that their motivation for launching BigONE was in response to the security breaches that were plaguing the bitcoin trading platforms around them. They felt “the community deserved better,” which explains their focus on security. BigONE boasts what they describe as a “trustworthy infrastructure” and a “high-class trading experience” fueled by speed, accessibility and secure management of cryptocurrencies. In its short trading history, there’s no evidence that BigONE has suffered any security breaches. According to Alexa.com, the majority of visitors to the BigONE site are from China, followed by Japan, the United States, Hong Kong and Vietnam. Interestingly, users visit BigONE after being on Coinbase as well as Candy.one and Binance. BigONE is a sophisticated site and may seem intimidating to the novice trader. But there’s a lot of help out there, including from other traders on a dashboard chat room. One user was asking how to buy ether, and another user explained they should first transfer their BTC to BigONE and then they could use it to purchase ether. They also support numerous individual coins, as listed by Coin Market Cap here. While BigONE is a bitcoin-fork friendly trading platform, “each forked coin goes through a strict licensing review process.” If all goes well with the hard fork in question, users will credited the forked coins afterward. So, there’s a bit of risk there to the user. The sign-up process is straight forward to start. Begin by entering an email address followed by a password. Once you’ve made it through the account verification process, you sign in with your email and password and will be promoted to enter a code that maybe generated by a Google authenticator app, for instance. Considering that the Know-Your-Customer (KYC) process could take an undetermined amount of time, ranging from hours to days, BigONE cautions its users not to make any deposits before the account is verified if they intend to trade. Users who have activated two-factor authentication can deposit and trade on BigONE. Meanwhile, traders who have completed the identity verification process can perform withdrawals, which the company characterizes as a “fast” process. Traders who have having issues with withdrawals most likely haven’t gone through the identification verification process properly. They must go through a series of steps to prove their identity, including a photo ID as well as selfie holding a picture of the photo ID with the date and name of the exchange written across it. On Facebook, user reviews are mixed, with users handing the exchange a rating of between one and five stars. One investor who gave the exchange a single star ran into problems trying to withdraw funds because of an old photo on her passport. She said the exchange asked too many questions, but that’s not necessarily a bad thing, especially if they’re trying to remain secure. Other users similarly had issues with their image not matching the picture on their ID, so there’s a pattern. And it wasn’t just on Facebook. A Telegram poster complained about not getting approved for the verification process because his image didn’t match his form of ID. The very same ID, however, worked on “many other exchanges” where he was approved. On the plus side, traders applaud the platform for supporting their favorite coins early, such as on this Reddit thread when IOS (IOST) was launched on BigONE. BigONE has a mobile app that’s available for both Android and iOS devices. User reviews weren’t readily available yet. In addition to the mobile app, BigONE also offers an API via GitHub for developers, which is available here. The API supports BigONE’s trading capabilities in other apps. It’s been assigned on GitHub as of Q1 2018 but there are no projects or milestones listed yet. 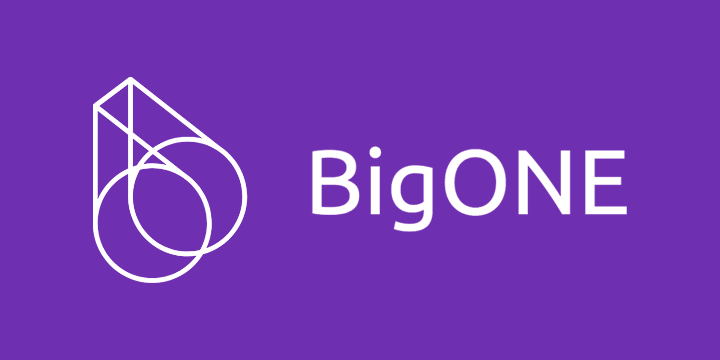 While there’s not too much information available on the BigONE API, it may be possible to glean from its predecessor, Yunbi. Yunbi was two pronged, comprised of a public API and a private API. The public API didn’t require verification, while the private version did in the form of a signature. It was available to individuals and merchants. BigONE is behind the ERC-20 BigONE token, and it’s got a cap of 200 million in circulation. BigONE is committed to repurchasing BIG tokens in the secondary market using a percentage of trading commission fees. BigONE is a newcomer, which means there isn’t much in the way of user numbers or trading volume yet, so it’s tough to make a call. But the fact that they use security in their tag line suggests this is the No. 1 priority for the exchange. Another thing they have going for them is the backing of INBlockchain and its management team. Traders can get their choice of tokens on the platform and trading pairs are added frequently, which is lacking at many other exchanges. If you prefer to use an exchange that accepts fiat money deposits, there are plenty of other options, and if BigONE’s 0.1% trading fees have you down, head over to Robinhood for zero trading fees by the exchange. While BigONE is a global exchange, it doesn’t support US residents, though they may be efforting an expansion into the US market. DO not use this exchange.